For a second I ponder what I – as a negotiator – think about that. Is talk cheap? Well… yes and no. Talking can be very expensive, because while we talk we aren’t listening to the other party, and we may thus miss out on important cues for how to influence that person. This is one reason why silence coupled with listening skills is often touted as the cheapest concession you can make in negotiation. On the other hand, having a conversation can be much cheaper than an exchange of force – as well as much more effective in getting parties what they want. So the expression “Talk is cheap”, like all insights in negotiation, is true in some circumstances. Our job as situational negotiators is to know when a particular insight is the most important insight. But I doubt this is the message the muscle man at the gym had in mind when designing his own t-shirt. And as I looked around the gym I noticed more t-shirts with similar messages, such as: “Only the strong will survive”. It seemed important for these individuals to communicate to the world that muscle is the primary tool for getting what you want. And if we substitute the more general word “power” for “muscles” then we’ll find that many negotiators think in exactly the same way. So what does power (or muscles) allow you to do? It allows you to dictate outcomes, and it allows you to force the other party to concede. That is very tempting, and often the main motivation for building power (or muscles). But… and there are some big but(t)s (especially if you work those glutes… ahem…). One is that use of power introduces a whole slew of prohibitive risks. We cover these extensively in the book. 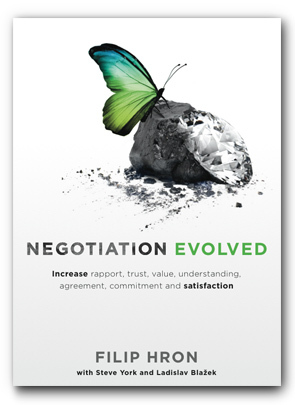 Another drawback is that negotiating using power – quite ironically – introduces the potential outcome of submission. Let’s clarify this using our gym example. If the only source of power is “muscles” or “strength”, then the strongest party in every negotiation will win and the weakest party will lose.